Regular exercise is the key. Your heart will really appreciate it if you do your cardio exercises today. You can dedicate a few minutes (7-30 minutes) of your time to exercise daily. Say goodbye to your vices and bad habits. 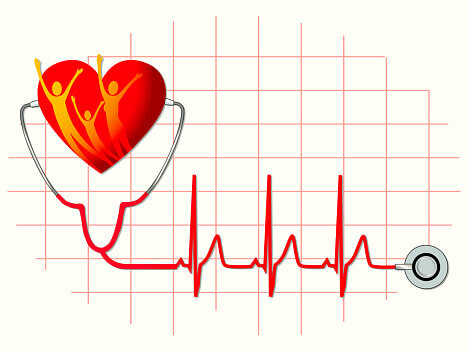 To keep your heart healthy, you should quit smoking, drinking alcoholic beverages, or taking illegal drugs. This might be difficult to cease right away, especially if you have become addicted to it. If you find it very difficult to do, you can consult your doctor for sound medical advice. Also, sleeping late and eating unhealthy food might be part of your unnoticed bad habits. Make it a point to stop these bad habits before you suffer from it. Make a record of your blood pressure levels daily. You should always monitor your blood pressure levels and try to see what went wrong with your lifestyle during the past few hours or days. Make immediate changes in your lifestyle. Yes, we all need food to gain the nutrients and energy we need. But is it enough to make our heart healthy? Limit yourself on saturated fats, salt, and food containing cholesterol and fats. You should start eating a balanced diet with fruits and vegetables as starters. You can talk to a dietician about the right food choices for your heart. Also, you have to monitor your weight as it can increase your risk of getting a heart disease. This is the most important commandment for people who want to take care of their heart. Stay away from situations that bring you discomfort or stress. If your job, daily routine, relationships, and other responsibilities bother you too much, try to prioritize and see what you can do to minimize the stress in your life. Be kind to yourself for once. If you’re looking for a well-recognized and efficient home care provider, you can always count on us here at Bayou Home Care. We offer Home Care in Louisiana. We will help restore your quality of life in the comfort of your own home. We will be your companions for a lifetime. For inquiries, feel free to call us today at any of our contact numbers: 985-252-0040 (Pierre Part) or 985-580-2273 (Houma).